Ahead of the midterms, voters were nearly four times as likely to say they were thinking a lot about Trump than about Pelosi, 51% to 13%. 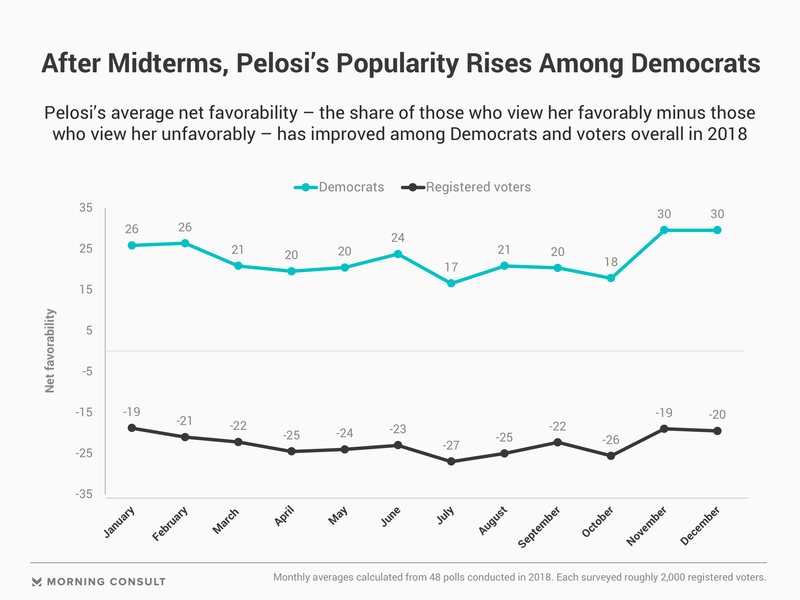 Pelosi remains unpopular among all voters, but she’s rebounded with Democrats since the party retook the House. Since at least the 2010 midterms, Republicans have made a concerted effort to villainize House Democratic Leader Nancy Pelosi as an out-of-touch liberal, messaging that strategists say contributed to victories during the Obama era. But after a painful loss in the House, the man Republican lawmakers have tasked with leading their efforts to grab back the speaker’s gavel said his party has focused too much on Washington’s most powerful woman. “I think we’re way too focused on Nancy,” said Rep. Tom Emmer (R-Minn.), the incoming chairman of the National Republican Congressional Committee. In a wide-ranging interview with Morning Consult at the party headquarters in Washington, Emmer said there’s “no question” Pelosi, who’s served in House Democratic leadership positions since January 2002, was a messaging boon for the GOP in past elections — and wouldn’t rule out turning to that trope again in the future. When it came to a name on voters’ minds, both Morning Consult polling and Republican strategists interviewed for this article said President Donald Trump was the overriding factor. 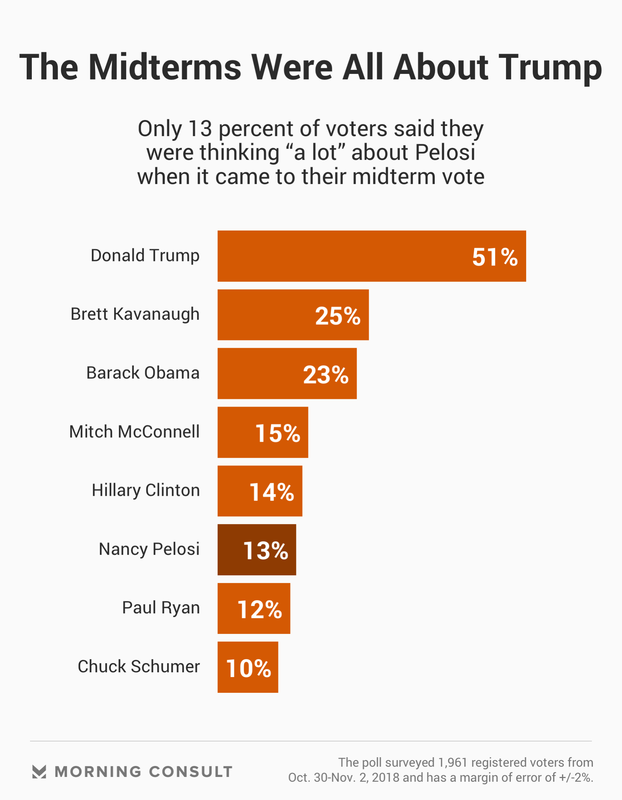 Voters were nearly four times as likely to say they were thinking “a lot” about Trump than Pelosi, 51 percent to 13 percent, when it came to their midterm vote, according to Morning Consult/Politico polling. Independents were twice as likely (60 percent to 29 percent) to say Trump was atop their minds, compared with Pelosi, and even 53 percent of Republicans said they weren’t thinking about her at all. One Republican strategist, privately discussing party strategy, called the midterm campaign’s attacks on Pelosi a necessary “diversion” for candidates to attempt to counter the downside from Trump, who is nationally unpopular. Emmer would not directly blame the president for the party’s messaging problem in the midterms, but he did say that a focus on immigration – Trump’s top message that was also embraced by many Republican candidates – was “clearly” not the way to appeal to independents. Morning Consult polling in July that focused on independents found that a quarter of voters who don’t identify with either major party cared about economic issues, while 14 percent picked health care, above opposition to Trump or security issues. Instead, he said Republicans should have touted a good jobs report, had a cohesive health care message and “personalized” the tax bill. How Pelosi governs the House could give Republicans a thread to tug on to win those voters back. Among all voters, the largest share who disapproved of Pelosi said they do so because she’s “too liberal,” not because she’s ineffective or too compromising, according to a November poll. Indeed, Emmer believes the critique that Pelosi and her ilk are too liberal could resonate in America’s suburbs in the future, particularly if young progressives angling for power in her caucus — such as New York Rep.-elect Alexandria Ocasio-Cortez — gain more prominence. Jeff Roe, a veteran Republican strategist whose firm Axiom Strategies has worked on House and Senate races nationwide, said Pelosi’s impact on Democratic candidates will depend on how she manages the liberals in her caucus. Polling suggests the attacks on Pelosi, who has never polled above water with registered voters in Morning Consult surveys, did move her numbers even further south. In October, at the height of campaign season, Pelosi’s popularity among registered voters was 26 percentage points underwater, with 26 percent of voters taking a favorable view of her and 52 percent taking a negative view, according to an average of five surveys conducted that month. Among Democrats that month, 48 percent viewed her favorably and 30 percent unfavorably. But after Democrats won the House in November, Pelosi’s standing rocketed among her base, averaging 30 points above water in November — driven largely by a drop in Democrats with unfavorable views. Among all voters, the November average was her best since January, according to Morning Consult tracking. Both Heye and Emmer said the next targets of anti-Pelosi messaging should be Democrats who vowed not to back her bid for speaker — and then end up voting for her in January. The Democratic caucus already nominated Pelosi, whose office did not comment for this story, for the role last month after an internal vote. Ahead of Pelosi’s successful bid for her party’s nod, one of her top allies in the caucus, Rep. Rosa DeLauro (D-Conn.), scoffed at concerns that the likely speaker would be a drag on the party’s future electoral chances.